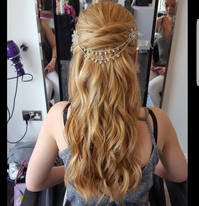 Prom Hair - half up, half down - Website of seventyfourhairandbeauty1! It’s that time of year when all the school leavers are getting excited as their exams are nearly over and they can start thinking about the Prom… What dress to wear, how to arrive in style and of course for the girls out there, how they will style their hair. This is a quick and simple style that won’t cost the earth. If you are familiar with SeventyFours website you may have seen this style before. I will let you know which one has used extensions for added fullness. I can point you in the direction of great products to create volume, texture and shine. A very simple style created with either a tong, wand or straighteners. Can be a tight or loose curl. For those whose hair doesn’t hold a curl I recommend you start with a tight curl and let it drop by itself. If the curl doesn’t drop out and you want a loose affect you will need to tease the curls apart and drag them down using a wide tooth comb or your fingers (which is what I prefer). Once you have created the desired curl you may want to create a little height at the crown by back combing and by using a root lift powder or spray, my favourite is Savage Panache by L’Oreal. Pin this in place and then pull back each side, this could be in a braid, twist or just as it is. Try to hide the pins by pinning underneath the hair. You will need a good hairspray to ensure it lasts all night. 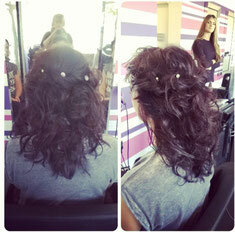 This was created using clip in extensions, She already had the length needed for the style but wanted added volume. We glammed it up with a little hair accessory. The curl was loosened to create a wave. To createa lovely shine on the finished style you can either run your fingers through the curls with a serum or use a shine spray, I would use Bedheads shine spray (pink bottle with a green top). No extensions were needed as she wanted a messy affect and this created a lot of volume itself. There was no height at the crown but the sides were pulled back in a messy twist and a few delicate hair gems were scattered around the twist. This style included teasing of the curls with my fingers to create a little loose backcombing, adding to the messy look we were going for. For more ideas you can see our previous posts, wedding hair Part 1 & wedding hair part 2. If you want to ready up on some products that will help you with your styles we also have posts that can help on volume and texture. For added volume you can have a look at are extension blog.